L-to-R - Deb Matthews, MPP London North Centre; Karen Bax, Managing Director, Mary J. Wright Research and Education Centre at Merrymount and Assistant Professor at the Faculty of Education at Western; Terry Spencer, Research and Evaluation Officer LDCSB; Sandra Savage, Mental Health Lead/Social Work Supervisor LDCSB; John Jevnikar, Chair Board of Trustees LDCSB. 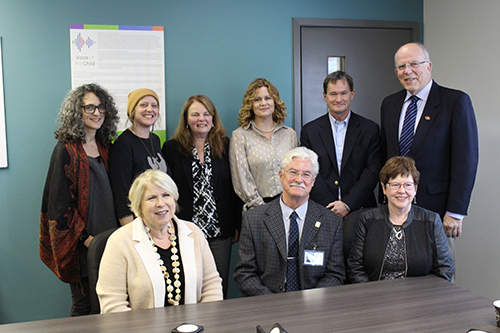 The London District Catholic School Board (LDCSB) in partnership with the Centre for School Mental Health and the Mary J. Wright Research and Education Centre at Merrymount were among four London and surrounding area programs announced by Deb Matthews, MPP for London North Centre to receive funding through the Ontario Local Poverty Reduction Fund. Matthews held a media announcement today at the London Family Court Clinic in downtown London to introduce the programs and the initiatives targets. LDCSB is receiving $438,100 to expand and evaluate the impact of the MindUP program, a mindfulness informed, social and emotional learning program that seeks to improve academic performance, attendance and self-regulation in children in kindergarten to grade 3. The MindUP program was piloted in 15 LDCSB kindergarten classrooms in the 2016-2017 school year and two parent/child groups at Merrymount. This grant will allow for scaled up research efforts and expansion of the programming into more classrooms, while continuing to follow those that were involved in the pilot year up to grade 3. Western University Faculty of Education professors Claire Crooks, Director of the Centre for School Mental Health and Karen Bax, Managing Director of Mary J. Wright Research and Education Centre at Merrymount are the research leads and work in close collaboration with Terry Spencer, Research and Evaluation Officer and Sandra Savage, Mental Health Lead/Social Work Supervisor on the project from LDCSB. Matthews announced that Ontario is investing $1.3 million in these four local programs which are supporting new ways to help people break the cycle of poverty, increase food security, find good jobs, and end homelessness in Ontario. These four local initiatives are among the 48 community programs across the province of Ontario that are also being funded by the Ontario Local Poverty Reduction Fund. Part of the funding that is imperative is the support for data collection and evaluation, which typically is second to providing service. The London Family Court Clinic, Unity Project for Relief of Homelessness, and M’Wikwedong Native Cultural Resource Centre are the three other projects in London and the surrounding area to receive funding. To learn more about the MindUP project and its pilot year findings, click here. To learn more about the Local Poverty Reduction Fund, click here. To learn more about Ontario’s Poverty Reduction Strategy, click here.